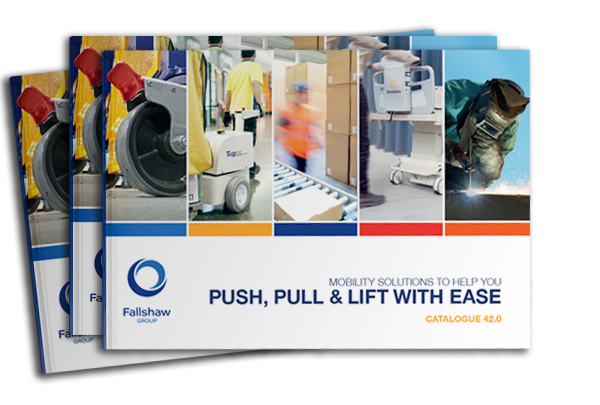 Palring and Paldisc turntables to improve manual handling. Turntables are a simple aid for safer manual-handling, eliminating the need for stretching and straining when loading or unloading heavy goods. Ideal for areas where more complex lifting equipment can’t be used, turntables are inexpensive and durable. 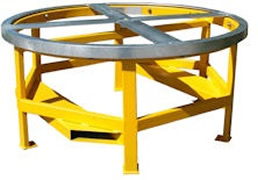 Goods are simply placed on the turntable and then manually rotated to avoid stretching across the load. 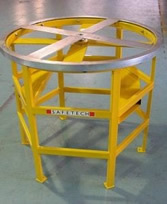 Palrings and Paldiscs can be supplied with stands or they can be fitted to the top of a Safetech scissor lift table. All turntables on stands have a captive centre pivot and are painted in safety yellow enamel finish. The Palring is an affordable, easy to use turntable, ideal for use alongside conveyor systems, feeding hoppers, extruders, process and production equipment. The Palring is tough and won't 'bind' or tighten up under load. For stainless steel or larger diametre Palrings, please contact us. The Paldisc is unique to the Safetech range and provides rotation of up to 2000Kg with an ultra low turntable height of only 24mm. Ideal for use with hand pallet trucks.